From the beginning, I was impressed/astounded with how relatively small the LA 2024 bid team was. I'd worked in a lot of countries where bid committees were grossly over-staffed with functionaries doing very little, and this made LA unusual in its economy. That concept of economy began with how the Bid was funded. Casey was adamant that the bid be funded by Angelinos, people who believed in the Games by putting their money where their hearts were. And they did. LA 2024, unlike any other Bid on which I'd ever worked, was entirely funded by private donations. No public money. No government support. That in itself was an astounding story. The Bid got great people to work there, too. I'd also be remiss if I did not acknowledge two of the nicest (smartest) members of the team, Brence Culp, our Executive Director of Sustainability and Legacy and Peter Tomozawa, our Vice President and Executive Director for Partnerships and Board Relations. These two fine and funny (as in humorous) people were always positive and upbeat, in addition to delivering one hundred percent for the Bid. Marla Messing joined the Bid as our Vice President and Executive Director of Sport Leader Relations, working mainly with the International Federations of sport to help make sure our venues were exactly what they needed. Olympic Family communications and International Relations was handled by the JTA agency, based in the UK. I'd worked with Jon Tibbs, the owner, on Beijing 2008 and Sochi 2014. His solid team of Sevi Hubert and Alex Corp (Alex was based in the LA office and quickly adapted to the SoCal lifestyle) did exceptional work as always. Jon's team worked with Jeff Millman and his group (Luca Servodio, Leigh Flores, and Barb Solish) on Comms, and with Jared Schott and Andrew Chatzky on IR. The team was ready for its first big turn as a Bid Committee on the grand Olympic stage at the Rio Games. Once again, the logistical team did a tremendous job - it always amazes me, every time. 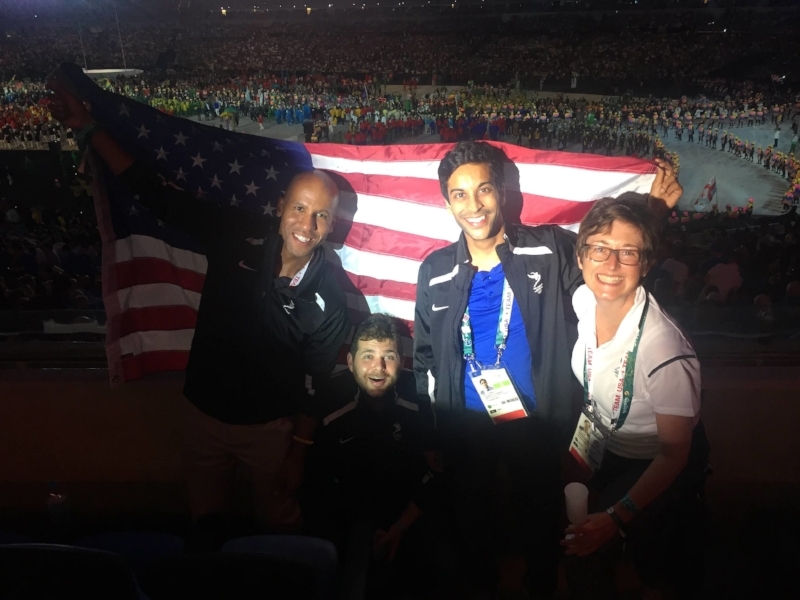 The LA 2024 team was spread around town in several hotels, and our main office was in the USA House on Ipanema Beach. Our role there was to listen, learn, meet and greet. And drink Caipirinhas. Which we did. Rio was fun. Here are some gratuitous photos in no particular order. When you have only twenty minutes to communicate complicated technical information and package it in a set of emotional, moving brand messages, it can be quite difficult. It is even more so when English is the second, third or sometimes fourth language of many of the speakers. With LA, I didn’t have this challenge. We had great speakers, and boy did they deliver – every time. I’ve worked on Olympic bids with minimal IOC membership, and some with zero IOC membership, such as Almaty 2022. The United States had three IOC members during the LA 2028 campaign – Anita De Frantz, Larry Probst (also Chairman of the USOC) and Angela Ruggerio. This was a blessing but also a challenge when it came to presentations, where only a limited number of speakers were allowed. In some cultures, this would have been a nightmare, but our three members were fair and objective as to who got to speak and when. They were gracious with each other and did an excellent job of helping our presentation team connect with their IOC member colleagues. I was particularly impressed with Larry Probst’s performances later on in the Bid. If you know Larry, I am sure you’ll agree that to say "he doesn’t crave the limelight", and "he isn't super enthusiastic about public speaking", are both understatements. However, like everyone in the bid, he was in it to win it. Larry and Scott Blackmun (CEO of the USOC) worked tirelessly over the past seven or so years to reset the relationship between the USOC and the IOC, so this bid was incredibly important to him personally. Because of his personality and stature, I was comfortable giving Larry some of the “pointy” messaging, gently challenging his IOC colleagues. I showed him his drafts, and he was fully engaged. He had some very sobering lines to deliver – and a few were starkly honest in their appraisal of previous US bid efforts. Humility wins every time if it’s honest. Larry performed like a champ, and many people remarked positively on his statesmanlike delivery. The most significant concern I had for our first presentation was how the US presidential election and the political climate in the US would affect us. In a word, it was distracting. I knew our competitors would seize upon it for political advantage (I would), and they did. So, we had to think of a clever way of reminding everyone in the audience that the United States was still the same country of ideals and values that we’d always aspired to be. That’s when an incredible, pleasant surprise fell into our laps named Allyson Felix. Janet suggested Allyson. Of course, I knew who Allyson Felix was (the most decorated female track and field Olympian of all time, and LA native), who didn’t? But could she speak and carry the message I already had forming in my head? We arranged a meeting with her and her brother/manager, Wes. I am rarely star struck anymore, but with Allyson, I just couldn’t help it. She is an icon - not only an Olympian but a legend, like Janet. And you know what? She is one of the kindest, most humble people I’ve ever met. I realized, immediately, what a treasure I’d been given to work with. Allyson: OK that sounds interesting, what do you want me to talk about? Me: I want you to talk about what it is like being a black woman in America, and of your love for and faith in our country because of its diversity; because this election is being used against us, and I believe you are the only person who can help refute that…are you comfortable doing that? Allyson: (not batting an eye) I would love to do that. And she did. Brilliantly. She was electric on stage, no one could take their eyes off of her or their attention away from what she was about to say. I’m not here today to speak only about my sport...my accomplishments...or even, LA 2024. I’m here to talk about America. the Olympic Games to help make our nation better...now, more than ever. We are a nation of people whose descendants came from all over the world for a better life. But...we’re also a nation with individuals like myself...descendants of people who came to America...not of their own free will...but against it. We just finished our presidential election, and some of you may question America’s commitment to its founding principles. America’s diversity is our greatest strength. Diversity is a leap of faith...that embraces all faiths. And with those words, the election and doubts about the US evaporated from the LA 2024 discussion. We knew we had to hit it head on, as we did (and will show) for every challenging issue in the 2024/2028 campaign. We felt great about it in the room that day. The positive feedback was instantaneous as well. The Olympic media called it a “masterstroke” to diffuse the issue. It was one of those moments in every bid that serves as a tipping point, meaning, if it works, there is a clear line of sight to victory. After Allyson’s speech and the entire team’s performance, our vision improved to 20/20, we could see the path forward. The 2024 Olympic and Paralympic Games campaign was the first to fully embrace social media as a tool promoting the Bids. The IOC rules limit promotion of each Bid in its national territory for a period of time, and only then are the Bids are allowed to promote themselves internationally after a specific date: in our case, it was 3 February 2017. You can immediately see the porous nature of this distinction in today’s media environment. In the old world, geographical limitation meant we could not purchase media or ad space outside our home territories until a specific date. In the new world, as long as our Facebook Live posts, Tweets, and Instagram posts, etc. originated in our home countries, we could do whatever we wanted whenever we wanted. A post by the Bid or a Tweet by Casey went around the world, instantly, and both LA and Paris were very aggressive with social media. Knowing the efficacy of this new tool, we worked closely with LA 2024's social media agency, Laundry Service, led by Cosette Chaput, to create a novel concept to kick off the international campaign in early 2017. We called it “What’s NOT in the Bid Book, with Casey Wasserman.” The concept was simple and its objective two-fold. First, we wanted to raise Casey’s profile within the Olympic Movement because was a newcomer. He was less known than the executives of the Paris bid. Second, we wanted to do something creative and fun instead of endless Tweets and posts about our Games Concept and venues (we did that too, by the way). So, we created a concept showing fun facts about LA that were NOT in the bid book, hosted by Casey. Cosette's team created some fun ideas that were easy, quick and affordable to do, nice to get all three. The results exceeded all our expectations, with over 5 million views. A lot has been written as to who first said what to whom about the possibility of awarding 2024 and 2028. I’ll leave it to others to debate, but we began hearing about it in earnest in late 2016. In hindsight, it was a brilliant idea - and whoever thought of the idea should take pride in its creativity and its stabilizing impact on the Movement for years to come. Rome 2024 dropped out of the race in October, right after the Rio Games. Of all our competitors, I must say the Italians were the nicest and friendliest of the lot. They were always gracious, and they hosted all the bids at Casa Roma during the Rio Games for an incredible meal. I hope Rome bids again (I enjoyed working for them on their equally fated 2020 bid), it could be a spectacular Host City. As the 2016 holiday season began, it appeared that discussions about 24/28 were taking place in Lausanne. In December 2016, President Bach finally hinted at the possibility of a dual award by stating that the current bid process produced “too many losers,” and he “wouldn’t rule out” a dual award of 2024 and 2028, but the IOC had to “study the issue.” It seemed apparent to everyone that he was intrigued, but the idea needed to clear more than a few hurdles within the IOC membership to make it happen. Then, Budapest 2024 dropped out in February. It wasn't a surprise given the ongoing struggle the Bid was having with public opinion, but they were a great team full of young, enthusiastic people and we were sorry to see them go. They'll be back. On 17 March, the IOC set up a “Working Group” consisting of the IOC’s four Vice Presidents. The group consisted of Australia's John Coates, Turkey's Uğur Erdener, China's Yu Zaiqing and Spain's Juan Antonio Samaranch. Its mandate was to review and discuss reforms to the bid process, including the possibility of a dual award for 2024 and 2028. It was clear that if this discussion was taking place, we needed a strategic plan; so, we set one in motion with specific messaging tied to specific timing. We designed a frank approach to the reality of the situation. Our goal was to be part of the discussion and the solution, but on our own terms as much as possible. Paris continued to state that 2024 was “now or never.” We thought that sounded a lot like an ultimatum. What we needed was a gracious, yet calculated way of addressing it. Lots of comments were flying back and forth. Finally, I said, “…let’s give the IOC some air cover on this …let’s say that LA 2024 that supports the IOC’s strategy of considering 2024/2028 - this paints us as good partners…”. Everyone agreed. Several of us began scribbling out the copy for a Casey Tweet, which went out the next day, 23 March. The Tweet generated a lot of chatter in the Movement as we were the first Bid to address the possibility in a positive light. I think that many of us in the Bid felt (or guessed) where the 24/28 debate might eventually be going, but a campaign is a campaign, and nothing is a done deal until it is a done deal. Our goal was to position against Paris’ perceived inflexibility and portray LA 2024 as an excellent partner to the Movement. The 2024/2028 strategy under consideration by the IOC is precisely the type of new thinking that the Movement needs. But, it only works if the IOC chooses the right 2024 city – the city that brings new ideas and new solutions to the Games – not more of the same. That city is LA. So instead of “now or never”, we think the IOC should focus on “new or more of the same.” That’s not an ultimatum, that’s an opportunity. But as in life, opportunities only exist for brief windows of time. In the midst of all this, we were told by the IOC that we and Paris would be making presentations at SportAccord in April. SportAccord is an annual sports and business symposium held in different locations around the world. One of the biggest draws every other year is a presentation by the Olympic Bid Cities. 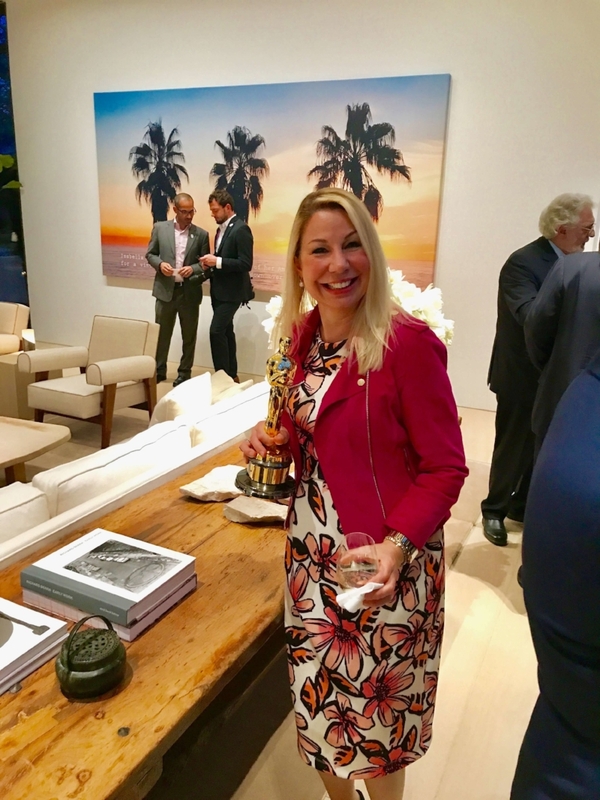 The 2017 SportAccord was held in the city of Aarhus, Denmark, one of Manav Kumar's (our key contact in Mayor Garcetti's office) favorite cities. SportAccord had its ups and downs with the IOC in recent years, and initially, the 2024 Bids were not slated to present. However, the International Federations requested a presentation from the 2024 Bid Cities because the NOCs received one in Doha at ANOC. So, the IOC allowed us a short presentation. We believed that the timing was perfect to deliver, in person, our thoughts on the 24/28 issue. The issue of 2024/2028 was finally out in the open and on everyone’s minds, so in typical fashion, we decided to address it head-on. Our speaker lineup for the short presentation was Mayor Garcetti, Gene Sykes, IOC Member Angela Ruggerio, and Casey. Normally, Mayor Garcetti closed our presentations because he was the most emotional speaker we had. But for this presentation, I chose Casey to close because, in his role as Chair of the Bid, I felt that it was important that he deliver the final comments on the 2024/2028 issue. Because of the "presentation order draw" at the beginning of the campaign, LA always went first in each presentation, and Paris last. If you can’t go last in a larger group, first is always best because you can pre-empt what the other Bids are going to say. And when it gets down to just two, going first is almost better than going last - especially if you have a great story. We used that to significant effect in Aarhus. There was an audible and collective gasp in the room, many frozen fake smiles evaporated, and everyone wondered what in the hell Casey Wasserman was going to say next. And finally, to address the negative, just under the surface, ever-present, and thinly veiled Anti-American sentiment we always experienced from some, he said, “Our bid isn’t about money, or ego, or American pride or even losing or winning – it’s about ensuring that the Olympic dream is achievable for everyone, as far into the future as possible…”. Juan Samaranch turned around, found me in the audience, and gave me a thumb's up at that point. I knew we'd hit the right tone and message. Casey delivered a great speech that day, and it got the room and the media buzzing. Our design partners at "MoveWild", from Madrid, Spain, once again dominated the visual backdrop. The people in the room and the Olympic media complemented our clear and crisp messaging, beautiful design, and our speakers’ performances. I met the MoveWild team on the Madrid 2020 Bid, and worked with them again on Almaty 2022, and with LA2028. They are superb people and world-class professionals. 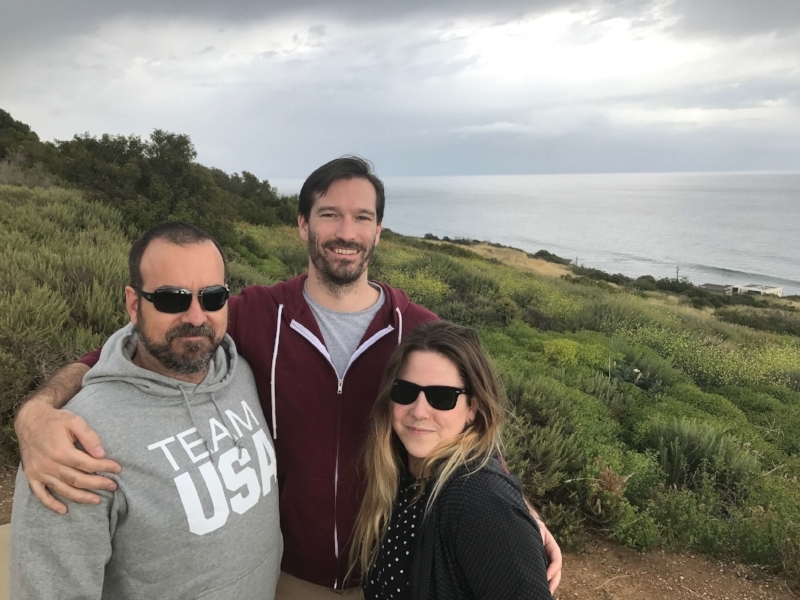 While we were busy prepping and implementing the messaging and the presentations, a huge team in LA was busy for months prepping for the IOC’s Evaluation Commission’s visit. Budapest’s departure from the race changed the dates long planned for, and our team did an excellent job of adjusting and rearranging an extraordinarily complex set of logistics at the last minute. John Harper and Hillary led the planning and management of an army of LA 2024 staff and external consultants. I would also like to point out the ongoing heroic efforts of Dwayne Jones, our logistical guru and the best party planner in LA. Dwayne and I had many shared moments, laughs and memories as two Southern Boys in the big city of LA. He's one of the best people I know. From the outset, we knew that we could not compete with the cultural bias (a well-earned one, by the way) that Paris enjoyed in the campaign. Paris is simply, in my humble opinion, the most beautiful major city in the world. Architecture, museums, culture, gastronomy…I could go on, but you get the idea, Paris has it. We knew we could not compete on any of those attributes. So, we fashioned LA’s Olympic vision on a very different set of attributes such as forward-looking, future-focused, dynamic, optimistic, modern, and yes, cool. A phrase that we used in the brand model working sessions, “New Games for a New Era”, became a workhorse phrase for the bid alongside the tagline, “Follow the Sun.” Our goal was to show the IOC EC that LA 2024 was ideally suited to deliver a New Games for a New Era – and we did. From the beginning, one of the most difficult challenges for the technical team, led by the uber-competent duo of Doug Arnot and Bill Hanway, was to sift through the plethora of existing, world-class venues spread all around LA for our Games Concept. We had an embarrassment of riches from which to choose for our venue plan. I’d written a line for Madrid 2020 that said: “we’re not changing our city to fit the Games, rather, we are adapting our Games Concept to fit our city.” Madrid 2020 was Olympic Agenda before Olympic Agenda 2020 was cool. But that’s another story. LA was in the same position – it had everything it needed to host the Games, including the Achilles Heel of most Olympic bids – LA had an existing, functioning, state of the art Olympic and Paralympic Village on the campus of UCLA. The entire LA 2024 team worked on the visit, serving as guides and speakers and whatever needed to be done. It was an incredible effort by an incredible team. When the IOC’s final report came out, we were happy to discover that our brand and messaging plan not only worked but worked splendidly. Members of the Evaluation Commission have used the terms “forward-looking,” “innovative,” “vibrant,” and “cool” to describe the Los Angeles candidature. When discussing the main differentiators of both candidatures, the two words the Evaluation Commission often attributed to LA2024 were “dynamic” and “futuristic.” Los Angeles is prepared to put its story-telling skills, creative energy and cutting-edge technologies to good use in delivering what it proposes will be a transformative Olympic Games that will thrill and inspire the world, just as some Hollywood masterpieces have done over the generations. As for Los Angeles’ Games concept, it’s all about inclusion. LA 2024 has proposed four self-contained Sports Parks that would extend the Games’ celebration across the entire city. Los Angeles would have very little to do regarding venue construction, as existing and temporary structures make up almost the entire venue proposal. I’d worked on more than a few Evaluation Commission visits around the world and over many years, and I would emphatically state that the IOC’s revised EC procedure is light years ahead of the old format. Chairman Patrick Baumann and his team led by Christophe Dubi and Jacqueline Barrett were superb – they were there to listen – and to help. It was refreshing, and I think signals a new, enlightened approach by the IOC, which will serve it well in choosing future Host Cities. But at some point, the cities do get to show off their creativity. LA 2024 hit a new high (for me at least) with its dinner with the EC - and in Sochi, we had dinner with Putin! 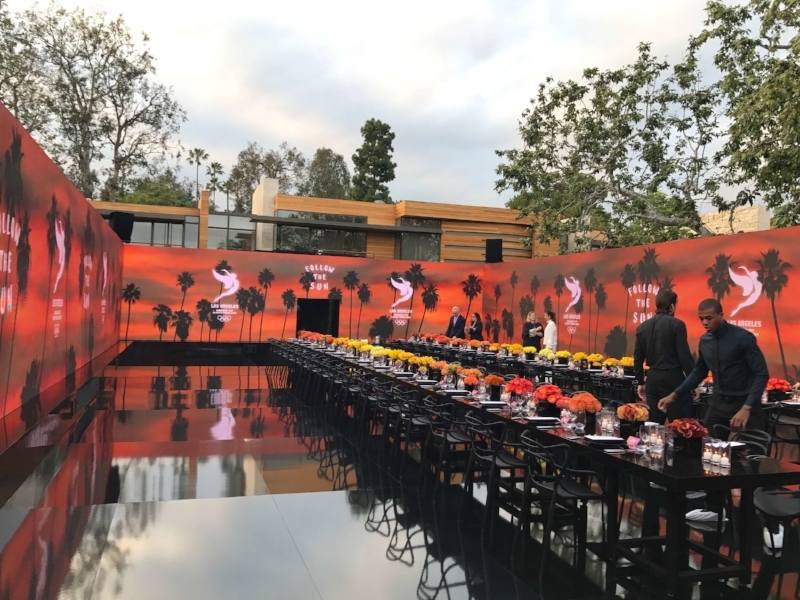 Casey's idea was to have the dinner at his home in Beverly Hills with some of his friends from the LA media, business, and entertainment community. With guests ranging from Sly Stallone to Kobe Bryant, the evening was set for something special. Then Casey told us about his idea of hosting it outside in his backyard, within a 360-degree, ten-foot-high video screen - and no ceiling - just the LA sky overhead (yes it was a clear night). Really. I was fortunate to be invited by Casey to attend. It was a fantastic evening, and one I told Casey and the Mayor that I would never forget. And I won't. Kobe Bryant and some old dude with a huge head. After the EC’s visit to Paris, it was apparent to everyone involved that a) the IOC had two excellent bids, and b) it was trying very hard to make them appear “equal” in every way. Again, it was obvious where this was headed, or attempting to head, but it was also clear that some members of the IOC and the Olympic Family still weren’t sold on the idea of a dual award. We believed that at least one of us in the race should hold up our hand and indicate a willingness to play ball, and remind the Movement that even though LA was flexible, it wouldn’t and couldn’t last forever. So, we decided to reiterate our position on the 24/28 matter and our belief in partnership instead of ultimatums. On 7 June, Casey submitted another Open Letter to the Movement. Some perceived it as bold, and some as confusing. Our goal was two-fold: take control of the 24/28 narrative as it pertained to LA (before someone else did), and generate some goodwill in Lausanne. To be blunt, LA 2024 has never been only about LA or 2024. Even when the issue of a dual award for the 2024 and 2028 Games was initially raised, we didn’t say it’s “LA first, ” or it’s “now or never” for LA: that sounds like an ultimatum. We could have used that strategy, but we didn’t because we thought it was presumptuous to tell the IOC what to do and how to think. We’re better partners than that. It has always been our contention that LA 2024 had to make as much sense for the Olympic Movement as it did for the people of LA. And we’ve stuck to that premise. We don’t believe in ultimatums — we believe in partnership; that’s why we are willing to look beyond ourselves and ask the question “how can LA best serve the long-term needs of the Olympic and Paralympic Games? Almost immediately the Olympic media pounced, some using the term “capitulation”. Even people on our team were taken aback by some comments whirling around the Olympic world. I admit, the next morning even I had second thoughts, and I helped write the damn thing. But, we endured it because we believed in the strategy behind the words, and frankly, our stated desire to “look beyond ourselves” was perceived quite favorably in Lausanne. In hindsight, it was the perfect, strategic foil at the right time of the campaign. End of Part 2; stay tuned for LA Confidential - Part 3. The Final Strech to Lima.